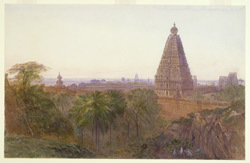 Watercolour drawing of the Brihadiswaraswami Temple at Thanjavur by Edward Lear (1812-1888), dated September 1874. Inscribed: 'EL. 1875'. Thanjavur was established and used by the Chola rulers in the 9th-12th centuries; it later became a Nayaka stronghold in the 16th-17th centuries and was also used by the Marathas in the 18th century. The Brihadishvara Temple, dedicated to Shiva, was built in the 9th century and is one of the great achievements of the Chola era. This monumental temple stands in the middle of a large rectangular courtyard surrounded by smaller shrines. Its steeply pyramidal tower stands at about 66 m and consists of 13 storeys, each with pilastered walls covered with carved figures of divinities. To the east a monolithic Nandi, the sacred bull of Shiva, is sheltered in a pavilion dating from the 16th century. Lear's 'Indian journal' entry for 20 September 1874 reads, 'This great pyramid is a wonderfully fine thing and, being old and weather stained and uncontaminated by whitewash, is all the more picturesque'.